I love the old postcards where the letters are filled with local landmarks. A few months ago, I created one for Springfield, Illinois. 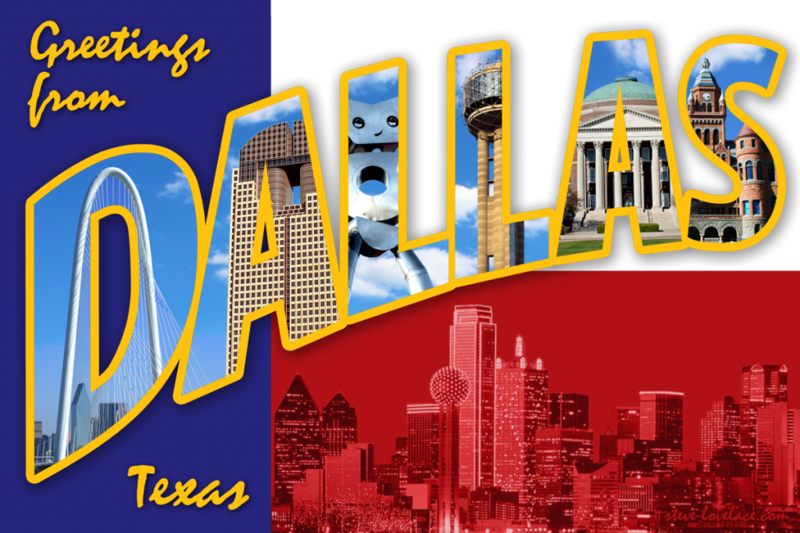 Ever since then, I’ve wanted to create one for my adopted home, Dallas, Texas. Here now is my new Dallas postcard. D: Margaret Hunt Hill Bridge. Completed just last year, this signature bridge connects Downtown Dallas to, well somewhere. I’ve driven across the bridge, and it just kind of dumps you into a working class neighborhood east of the Trinity. Oh well, at least it looks nice. A: The Chase Tower is one of my favorite buildings downtown, since it has a big keyhole in it. Recently, they added a Chase logo to the top left corner, ruining the symmetry of the building. L: The Traveling Man statue was built along with the new Green Line light rail through Deep Ellum. L: Reunion Tower is Dallas’ most famous tower, though it’s not as big as it looks. A: Dallas Hall is the central building of Southern Methodist University’s campus in University Park, just a few miles north of downtown. S: The Old Red Courthouse is a Richardsonian Romanesque building right by Dealey Plaza. It used to house the county courts, but now it’s a museum and wedding venue. Unfortunately, since the word “Dallas” is shorter than “Springfield”, I was only able to squeeze in six monuments instead of ten. Are there any landmarks you think I should have used instead? Let me know in the comment section.